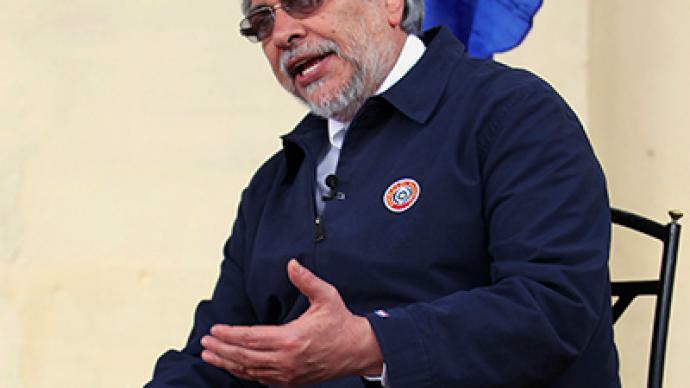 Paraguayan ex-President Fernando Lugo says he was forced not to resist his impeachment by a threat of massive violence which may otherwise have been rocked the country. Lugo was ousted from power in what neighbors called an institutionalized coup. ­The democratically-elected leader was voted out of power by Paraguay’s predominantly right-wing parliament after a trial which lasted just a few hours. Lugo was charged with poor performance in office. 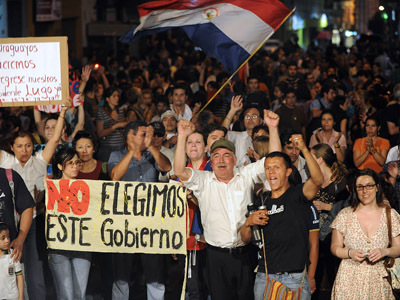 The move triggered domestic outrage as well as criticism from Paraguay’s neighbors. Latin American free trade groups Mercosur and Unasur suspended Paraguay in reprisal for Lugo’s removal from office. The ex-president’s supporters say he was targeted over the policy of development of regional trade ties he introduced. In an exclusive interview with RT, Fernando Lugo says he was compelled to step down from power without a fight by the threat of widespread violence being provoked in Paraguay. RT: Mr. President, welcome to the program. How do you feel about recent events – what are people saying? I would first like to say hello to your audience. I am happy to see the international press interested in the events in Paraguay: the parliamentary coup and the Paraguayan people who resist it. We have all lost here. 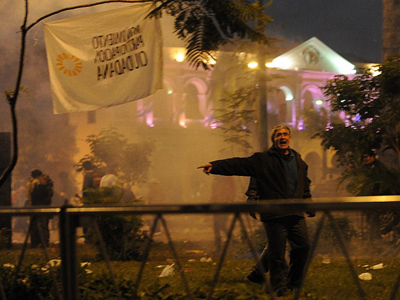 This parliamentary coup disrupted the democratic process in the country and made it lose, as well as the whole region. It distressed MERCOSUR and UNASUR. Paraguayans are outraged. Some say there was no coup because of zero violence and no tanks on the streets. Indeed, it was nothing like a military coup of the 1970s and 1980s. But it was a grave violation of law. A president who was elected constitutionally by a majority of votes gets illegally ousted. That really made the people angry. RT: Mr. President, right after you were voted out of office, you spoke as if you were resigning of your own accord. You also looked as if you weren’t quite yourself. Later we saw a more energetic Lugo, like the one we see now. So why did you fail to be as convincing in your resistance to the coup in those first hours? FL: I saw people out in the square. They wanted me to go because of the ministers. I knew that a new massacre was being prepared. I am a convicted pacifist. I didn’t want to see any Paraguayan lose their blood as a result of violence. That is why we went along with this illegal and unfair process. It was a politically-charged trial disguised as a constitutional process. As one MP said, it all looked like a circus designed to depose a democratically-elected president. RT: What do you think about media accusations that are circulating speaking out against Vice-President Fernando Franco taking over? Do you agree with thoughts that the situation may aggravate; once the international interest in Paraguay wears off, or the international community stops following events in Paraguay so closely? FL: I believe it may be right. Presently, it’s not only the international media that watch Paraguay closely, but so do international organizations. We can definitely say that today in our country, there is prosecution on political and ideological grounds. On Monday, the European Commission and Organization of American States will arrive in our country. We are also asking UNASUR , MERCOSUR and other international organizations to participate in the process of restoring the democracy in Paraguay. This isn’t just about the April 2013 election. This is also about getting equal opportunities, and eliminating censorship and persecution for ideological and political reasons that are taking place in our country now. RT: You mentioned the regional blocs UNASUR and MERCOSUR, even though Federico Franco, who replaced you, declared that he was going to rebut Paraguay’s expulsion from MERCOSUR. It looks like those groups’ leaders who agree on this will make that difficult for him. What consequences of the long-term expulsion from the regional blocs do you foresee? FL: We wouldn’t want to see those consequences. There’s a widespread saying that innocent people pay for the transgressions of sinners. Isn’t that true? We wouldn’t want to see economic sanctions or an economic blockade have a negative impact on the lives of common people who export their bananas, pineapples and oranges to Uruguay and Argentina. They will be the ones who end up hurt the most. Therefore we disagree with the economic blockade of Paraguay. But we do support sanctions against these serious violations. This is why Paraguay’s expulsion from MERCOSUR and UNASUR was a sanction against the political forces that staged the coup. RT :I’d like to ask you, firstly, what do you think about the role of the Organization of American States? Secondly, in your view, what were the objectives of the EU countries such as Spain, Germany and France when they recognized Fernando Franco’s takeover almost immediately? FL: The strange fact is that most nearby states in the region don’t recognize it. I believe it’s much more important, as there are such countries as Vatican City and Taiwan. But what’s the political weight of places like Vatican City or Taiwan? How can you compare 23 foreign states with the political weight of Argentina, Brazil or Uruguay – our neighbors and brotherly states with whom we’ve been maintaining commercial, diplomatic and political relations? RT: What does the position of the Church in this matter mean for you as a believer? FL: I believe that in politics, reality is the most important aspect. The Vatican’s decision may well be symbolic but, as I’ve said, it has no real weight from the diplomatic, commercial, cultural, and political viewpoints, even compared to a country as small as Uruguay. Uruguay’s recognition is much more significant than that of any other country, including the EU. RT: So what are the media doing with their reporting? What is the role of the media here in Paraguay? I mean, one thing which drew our attention here in Asuncion is that the political situation in the country is not being talked about much. Why is society reacting like this? Is it fear or just apathy? FL: The fact of the matter is they don’t like to talk about such events. Most of the media here. The main thing is that nothing has happened, according to the media, all is quiet; there are no rallies, no death, no blood, because I, the president, and the legitimately-elected government, don’t want violence or blood. Therefore it is important for the media to reflect the truth. What is going on here now is a disruption of the democratic process. And the people won’t forget this. There are things that are never forgotten just because nothing is said about them. I think this parliamentary coup committed on 21-22 June this year will not be forgotten by the people, because the coup is etched in their minds, their personal history and the history of civil society. And, as I say, if nothing has happened, why has MERCOSUR expelled us? 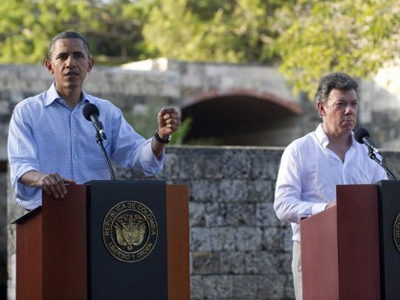 If nothing has happened, why has UNASUR expelled us? If nothing has happened and everything is alright, why is the European Union sending a commission to our country? The Organization of American States held an extraordinary meeting and a commission has come here from that organization. So it can’t be so that nothing has happened. Something very serious has happened here, a serious violation, a parliamentary coup, a coup d’état, when the president, elected according to the Constitution by a majority of votes, was impeached overnight. RT: In 2011, WikiLeaks posted a cable dated 2009 from the US embassy in Asuncion to the US Department of State. It contained rumors about opposition plans to topple you through Parliament, and to hand power to Federico Franco. Were you aware of this document? FL: No, I wasn’t aware of the document that was published in 2011. But I’ve said that Parliament talked about a political trial for me 23 times in all these years. I always insist that the key merit of our government is that it didn’t give up in view of these threats of political trials, especially on the part of Parliament. As for this issue of plotting and expulsion, I keep saying that politicians will never forgive the fact that a such a toad of an unknown origin as Fernando Lugo who comes neither from the political elite nor from traditional political parties, just out of his obligation to the people, took their place that belonged to them as politicians, the chair of the Lopez dynasty at the Seat of Government. RT: Some say you could have drawn on popular support for reforms, for instance, in agriculture or energy security, to resist a parliament that was getting increasingly antagonistic. Do you think you missed a chance to ease tension? Is there anything you could have done better? FL: I don’t think so. This parliament is dominated by traditionalists, conservatives and right-wingers. And even if Jesus Christ shows up out of the blue and tells them to change their mind, they won’t. We were sabotaged all the way. Parliament gave us a budget with a deficit of $800 billion, so funds were in short supply for everything. And when the Chacao flood propelled a deep crisis, they asked us for $50 billion for their politicians. Mind you, these politicians are members of political parties who get paid for nothing. So we said no. That was the straw that broke the camel’s back. RT: What about the long-standing problem of land ownership? A whole of 82 per cent of the territory is owned by only 2 per cent of the population. And though revamping agriculture was one of your election pledges and something you strongly believed in, you have failed to lobby it. So who wields the real power in Paraguay? FL: A country’s land ownership structure defines its economic structure. And with the same parliament, whoever brings this question up, will end up just as Lugo. Today it depends to an extent on executive power, but it is the judiciary that sets the tune. The right to land is within the realm of the judiciary. Paraguay is 406,000 square kilometers large. But if you take all the rights to land together, its square will exceed 529,000 square kilometers. It is the judiciary that grants rights to possess land that already has two or three owners. RT: You say this problem has no solution as long the same people remain in parliament. Can you change the situation through democratic elections or there is a fundamental flaw in Paraguay’s political system? FL: I’d say both. The constitutional system is flawed. Our constitution was drafted in 1992 after the fall of a 35-year-long dictatorship. And we handed the bulk of powers over from president to parliament. Now it’s the parliament that has the most political clout. RT: And these events have proven it. FL: Indeed. We submitted two claims on breach of the constitution to the Supreme Court. But they were never published because parliament blocked them. In other words, parliament is used to threatening and blackmail as an argument against other branches of power. RT: One last question, Mr. President. Franco promised he would not run for presidency in the April elections. Now he says he will step down by August 15. Will President Lugo seek a comeback through a democratic election? Can you picture yourself as a 2013 candidate? FL: There are a number of ways out, including legal and political. As for the legal track, we have initiated proceedings on constitutional violations. The court has handed it over to the prosecutor’s office. Should the court rule I return, I will immediately take office. But this scenario is unlikely. I believe I will have to take the political track and run for presidency. They can tell me I have already been president and can only be re-elected after one term in power, in accordance with the constitution. But where there is a will, there is a way: if you want to keep a person from running for office because he is a people’s favorite and therefore a serious rival, there are lots of legal tricks to do that. RT:President Lugo, thank you for your time. FL: Thank you and thanks to everybody who was watching us.